Within 20 minutes of collecting my bag at Nairobi international airport I’m already driving through seemingly endless savannah on the trail of hunting lions. Nairobi National Park is often overlooked – and occasionally actively scorned – by inexperienced safari ‘aficionados’ who see it as little more than an urban safari park. In fact Nairobi NP deserves recognition as an incredible wilderness region where great herds of zebra and antelope graze alongside herds of several hundred buffalo. Despite its location, right on the edge of the city, Nairobi National Park boasts about 80 rhino and a population of lions that is almost too large for the area. Recently two wonderful accommodation options have opened here (Emakoko Lodge and Nairobi Tented Camp) and it is to be hoped that more people will realize that you can now start your safari within a few minutes of leaving the airport…rather than have to battle across town to an inner-city hotel through Nairobi’s notorious traffic. This remarkable and in many respects unique national park borders the southeastern suburbs of Nairobi, the bustling capital of Kenya. Though fenced on the city side, for obvious reasons, the park remains unfenced to the south, allowing wildlife from the bordering Athi Plains to move in and out freely. 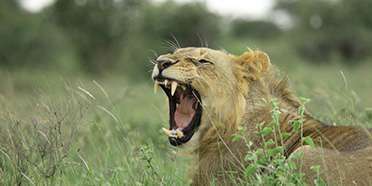 Game viewing can be erratic, but it is often very good – on our most recent day visit, in late 2011, we had two good lion sightings, and saw several white rhinos, along with the likes of giraffe, buffalo, baboon, eland, and various smaller antelope. The birdlife is exceptional too, with large grass dwellers such as ostrich and secretary bird found alongside more unusual species such as the localised northern pied babbler. In our experience, the best time visit is at 6am, when the entrance gates open and animals are most active, rather than waiting for the more normal post-breakfast departure. A striking feature of the park is the distinctive skyline of the city centre, which can be seen from several vantage points, and the park as a whole pays heartening testament to the tenacity of large wildlife within roaring distance of one of Africa’s largest cities. For anyone spending a few days in Nairobi, a tour of Nairobi National Park should be at the top of your must see list – unless you’re already gamed-out, that is. In the dry season, this wonderful wildlife sanctuary, which literally lies at the edge of the city, teems with game. 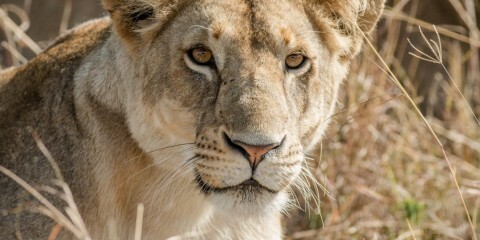 It’s certainly one of the best places in Kenya for seeing rhino, lion and cheetah at very close range and also one of the best places to see servals for anyone with a cat fetish. On my last visit we easily spied zebras, Cape buffalo, rhino, hartebeest, elands, crocodile and a brand new baby giraffe. At the hippo pool there is an armed guide who’ll walk you along the river to several pools frequented by hippos. There are also plenty of opportunities for bird watching. On leaving the park, I’d suggest you loop back to Nairobi through the leafy outer suburb of Karen - once the home of Karen Blixen of Out of Africa fame – and visit the museum set up in her former home which looks out over the Ngong Hills, under which Blixen’s lover Denys Finch-Hatton is buried. And don’t miss nearby Giraffe Manor where you can eye-ball a giraffe and feed them straight from your hand. There’s something rather surreal about the sight of a small herd of wildebeest or buffalo, a pair of giraffes or even a cheetah and her cubs pacing across a grassy plain within sight of a city centre. These are not zoo animals – they’re wild – but I had to keep reminding myself of this whenever I lowered my binoculars from an animal sighting and once again caught a glimpse of Nairobi’s distant towerblocks through the heat haze. I’d recommend Nairobi National Park if you’re on a brief visit to Nairobi, or are in transit, and have a few hours in the early morning or late afternoon to spare between appointments or flights – it’s quick and easy to get to from the city centre and the sense of being out in the wilds is surprisingly satisfying. After many visits to Kenya, I finally decided to have a look at Nairobi National Park. It’s location in the city never appealed to me, but for the particular photo commission I had taken on, I needed a picture of animals against the Nairobi skyline. Although I’ve seen many great images like this taken in this park, it is easier said than done. In fact the repeated images showing this, might give you a wrong idea. Most of the park doesn’t give a view of the skyline at all and it is quite easy to forget you’re in the city a lot of the time. I visited in the rainy season and it poured down with rain, but the game viewing was very good and certainly exceeded expectations. We saw a lioness hunting and several rhino, which is said to be very rare. Next time I’ll have a spare day in Nairobi, I’ll go again! Nairobi National park is located within a stone’s throw of downtown Nairobi. The park’s wide-open grass plains and scattered acacias are juxtaposed against a backdrop of city skyscrapers and noisy highways, ensuring that this park scores lowest marks in terms of ‘wilderness vibe’. There is, however, something very unique and surreal about taking a game drive and seeing a surprising variety of wildlife right amidst the capital city. Aside from the endangered black rhino and lion, you stand a chance of spotting the more reclusive leopard, cheetah and hyena, although my experience has been that healthy populations of buffalo, giraffe, general game and abundant birdlife are more reliably sighted. Along with Lewa, Nairobi National Park is Kenya’s foremost black rhino sanctuary, but the reserve is probably most famous for the highly publicized burning of Kenya’s ivory stockpiles in front of the international media: an unequivocal statement from Kenya that the ivory trade should never resume. I can’t say enough good things about Nairobi National Park. I’ve visited the park numerous times over the years and have never had a disappointing safari. The park is situated hard up against the city of Nairobi and for those who want a ‘pristine’ wilderness experience then Nairobi National Park, with its backdrop of tower blocks, is quite definitely not going to suffice. But for straight out quality wildlife viewing including all the Big Five bar elephants, amazingly easy access (I’ve been on an evening safari here and half an hour later been checked in for an international flight home) then no other park can come close. I don’t think I have ever been on a safari here and not seen rhino (both black and white). I’ve also watched lions hunt warthog not once but twice and even witnessed cheetah hunting. There’s a lot of plains game here including herds of zebra, impala, buffalo and plenty of birdlife (over 400 species), beautiful, rolling savannah scenery and, despite it being just moments from the city centre you can often have the place much to yourself (avoid weekends and holidays though). There are now a couple of upmarket lodges and camps within or close to the edge of the park meaning that you can be enjoying the full Africa safari experience within minutes of leaving the international airport. Also, I can think of almost no other park that is so perfect for a family safari with younger children – even more so if you combine it with a visit to the nearby Giraffe Centre and the David Sheldrick Wildlife Trust where you can play with orphaned baby elephants and rhinos. Just a short drive from the big city, Nairobi National Park isn’t exactly a wilderness experience but if you don’t have the time to visit one of the country’s better-known parks then this is a good option. Nairobi’ encroaches upon the park on several sides, making for unusual photo opportunities such as giraffe grazing peacefully amongst the thorn trees with the city skyline as a backdrop. Lion, buffalo, rhino, leopard, giraffe, impala and zebra are well represented here and those keen on cute baby elephants can visit the David Sheldrick Elephant Orphanage close to the main entrance of the park. I found it very strange the first time I went on a game drive through a proper bona fide national park with a background of skyscrapers on the skyline. But it would be far too easy to dismiss the Nairobi National Park as a souped up safari park. It really isn’t. Perhaps the true wilderness vibe is missing – it is just too small, too crowded and too close to civilization. Nor is it scenically spectacular. But the wildlife is good, it is excellent for children with thousands of local schoolchildren visiting each week, it has some real treats, and it has one massive advantage. Only 7kms (4 miles) south of the city centre, it is quite possibly the most accessible game park on the planet. Because it is so close to the city, it is possible to pop in for the afternoon and get a fix of the great outdoors. Nairobi was Kenya’s first national park, established in 1946. It is also the headquarters of the Kenya Wildlife Services and the place to come to get your card for access to other parks across the country. It covers 117 sq kms and, because of its proximity to the city is completely fenced. It does have lion, leopard and black rhino but the only elephants are those in the Sheldrick Elephant Orphanage near the main gate. This has become one of Kenya’s top attractions with an off-the-scale ‘aaah’ factor. There are very few things cuter than a baby elephant, except perhaps many baby elephants with a hard luck story thrown in. Visiting time is from 11-12 daily. Don’t miss it, they are glorious. I wanted to take one home. A more recent addition to the park’s attractions has been the Safari Walk, a 27 acre near the gate zigzagged by boardwalks on which you can wander through three different eco-systems (woodland, wetland and savannah) with a bird’s eye view of the wildlife and vegetation. There are regular guided walks by rangers and the whole thing is fully wheelchair accessible. 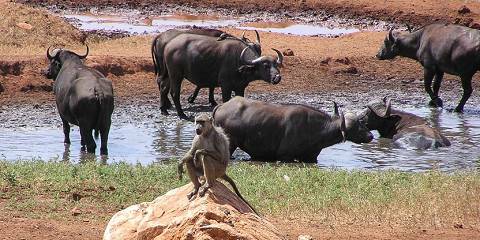 Possible sightings include rare species from cheetah to pygmy hippos, bongos and albino zebras. This can get a bit museumy, but you can learn a fantastic amount, should you feel inclined. Also within the park there is a memorial to the symbolic burning of Kenya’s ivory stockpile by President Daniel Arap Moi as they started the fightback against elephant poaching. And nearby, outside the park, stop off to visit the Giraffe Sanctuary, where you can get up to eye level to handfeed giraffes with cattle cake. Finally, a tip for those in a hurry or on a budget – the Ranger Restaurant at the park gate has a great verandah overlooking the park. You can have a very good meal and watch the game without having to pay the entrance fee! 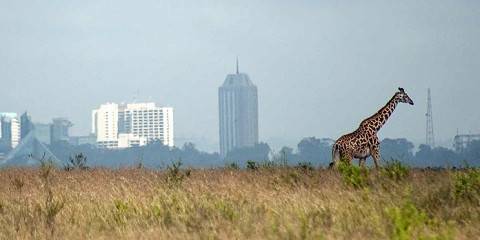 Only a 20-minute drive from the city centre, the uniqueness of this park is its closeness to Nairobi – most visitors get to take that photograph of a zebra or giraffe browsing peacefully with the downtown skyscrapers rising beyond. I’ve always found my game viewing easy here, the gravel roads across the grassy savannah are suitable for normal cars (a taxi can take you), and the park staff usually know exactly where lion, cheetah or rhino can be located at any time. But its smallness and semi-urban location did give me the sense of it not being in the wild and it takes on the feel of a safari park when there are lots of other vehicles (try and avoid the weekends). I wouldn’t make a special effort to go to Nairobi just to visit it, but instead it acts as a wonderful precursor to a safari in Kenya’s larger parks – or afterwards if you’ve missed one of the Big Five such as black rhino or buffalo. All in all half a day here is enough to spot a fair variety of game, and it’s amazing that within one hour you can go from a hip coffee shop to photographing some of the animals and birds you are expecting to see in Kenya. It can feel pretty incongruous searching for wildlife within sight of city skyscrapers, but Nairobi National Park is no ordinary park. Founded as one of Africa’s first parks in 1946 ostensibly to keep wild animals out of the city’s streets, the park has since become an important refuge for the black rhino – with more than fifty in residence, it’s the most densely populated collection of black rhinos on earth; on a recent afternoon in the park, I saw ten black rhinos. Lion, leopard and cheetah are also present, along with hyena, buffalo, wildebeest and zebra, although sadly no elephants roam the park. The birdlife – more than 400 recorded species, almost as many as in the entire UK but within just 117 sq km of park – is extraordinary for a park of this size. Despite the park’s proliferation of wildlife, the proximity to Nairobi means that it’s always busy and I always feel a safari here is like an appetizer for the main event, a fine way to spend an afternoon while in Nairobi before heading out into the wilderness for a real safari.